Hajj 2015 saw a tragic stampede that claimed the lives of more than 2,400 pilgrims. The ensuing chaos made it difficult for people to reunite with their family. Most of all, it was difficult to identify bodies of the pilgrims that succumbed to their injuries. 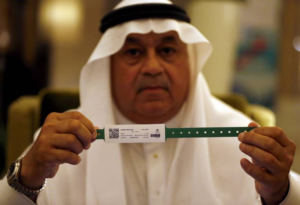 To avoid the chaos, the Saudi Government has issued QR Code ID Bracelets to Hajj pilgrims this year. To view the information, all one has to do is scan the QR Code with a scanning app using any smartphone. The vice secretary of the ministry of hajj and umrah, Issa Rawas, told AFP “The aim is to equip all pilgrims”. It also offers multilingual instructions on Hajj rituals. This makes it easier for pilgrims to perform their obligations. It is not just the government that is issuing these QR Code ID bracelets. A lot of travel agents have also issued these bracelets to ensure the safety of their passengers. This is how QR Codes are being used for security and identification purposes. This bracelet is the first step towards managing the safety of more than 2 million pilgrims. What are your views on this? Mention in the comments below.